Home | Teague, Richard A.
U.S. automotive designer who was born in Los Angeles. His mother worked in the motion picture industry, and at five years of age, he appeared in five episodes of Our Gang, playing the role of Dixie Duval, a girl. He studied at the University of Southern California and during WW II he worked as a technical illustrator for Northrop Corporation. His boss was Paul Browne, a former designer at GM, who suggested he take night classes at the Art Center College of Design, which he did. After the war, he worked for Henry Kaiser on the design of a small economy car and in 1948 joined General Motors as an apprentice stylist where he worked on the 1950 Oldsmobile Rocket 88 and in the Cadillac studio. In 1951 he joined the Packard Motor Car Company as chief stylist, and worked on the 1953 Caribbean and the entire Packard line for 1955. He also designed the last Packard concept car, the Predictor. When Packard went down, the entire Packard styling team went to Chrysler, and Teague became chief stylist there, but soon left to work for an independent design firm. In 1959 he began his long career at American Motors, becoming styling director in 1962, where he designed the 1963 Rambler Classic and the Ambassador, the first new cars from AMC since 1956. 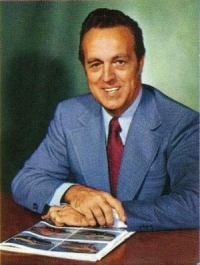 He was promoted to design vice-president in 1964, a position he held until his retirement in 1983, during which his hand was in the 1968 AMX-GT show car. Teague was honored by Automotive Industries magazine in 1976 as ‘Man of the Year,’ and was honored with the “’Eyes On Design 1999 Lifetime Design Achievement Award’ for his accomplishments as an automobile designer. Teague was also a noted automobile historian and collector. Over the years, he owned ‘400 or 500’ cars, including a 1904 Packard. His collection was donated to the San Diego Automotive Museum. Teague’s son, Jeff Teague, is also an industrial designer.